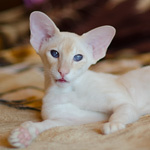 Breeder: Bogdanova Tatiana, cattery "Alien Invasion"
I'm very thankful to Tatiana of this nice boy! Litters: "P", "Q", "R", "S"
Over was born at the friendly cattery Alien Invasion. I'm very thankful to Tatiana Bogdanova and Ludmila Likhacheva for collaboration that give such perfect results as Over 9000. I have plans for use Over in my breeding program and I hope he will give perfect descendants as he is.